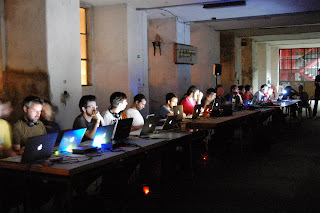 This was a 20 laptop musician orchestra with a singular intervention of 2 minutes each artist in its own way and style. In the end they all played simultaneously. As an industrial line production the first performer play during two minutes and in the end send the signal to the second one... and so on. ThIS line production also used the environment and the acoustic properties of the room which was actually an old factory. 20 músicos da electrónica residentes em Portugal são convidados a conectar entre si, em modo sequencial, os respectivos laptops e a reprocessar captações sonoras feitas in loco, num momento inédito de improvisação. Artists: André Gonçalves, Carlos Pereira, Carlos Santos, Fernando Fadigas, Francisco Janes, João Castro Pinto, John Klima, Miguel Sá, Nuno Bernardino, Nuno Moita, Nuno Morão, Paulo Raposo, Pedro Boavida, Pedro Lopes, Rui Costa, Ru*mor*, The Beautiful Schizophonic, Vítor Joaquim e Yari.